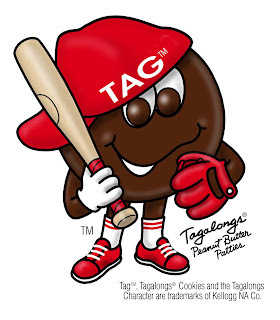 Living In LoCo: Tagalongs, My Favorites! There is a discrepancy between the Girl Scout cookie sales reports and the online voting at GirlScoutCookies.org as to whether Thin Mints or Samoas (aka Caramel deLites) are America's favorite cookie. 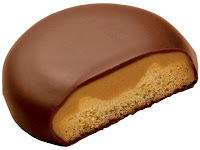 Regardless of which you trust, Tagalongs (aka Peanut Butter Patties) come in a solid 3rd place. Since these are my personal favorites, I am a little shocked, but that's fine, it means less competition for me! Chocolate Peanut Butter Parfait (which reads like a rather challenging recipe) or Southern Peanut Butter Pie (I am imagining it melt in my mouth right now), both found on the web site for the GS Council of Western Washington. And, even though these sound really, really good, it goes against my grain to chop up these cookies in anything other than my very own mouth. I love them almost frozen, or completely melting in my hands! I simply love these. The only problem, I open a box and those darn cookies run and jump into my mouth and next thing you know they are on my hips! To me, another hour on the bike at the gym seems worth it to enjoy these wonderful treats! Have you ordered your Samoas, Thin Mints or Tagalongs yet? Place your order early!! In Loudoun and the Dulles area, please contact me for details. Elsewhere, please find a cookie sales-scout near you at http://www.girlscoutcookies.org/.